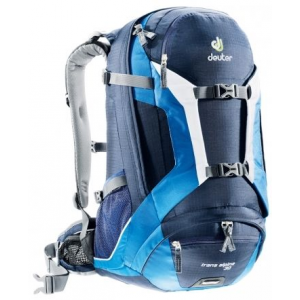 The Citro 25 is a good-sized and reasonably lightweight day pack with a surprisingly strong spring steel frame. 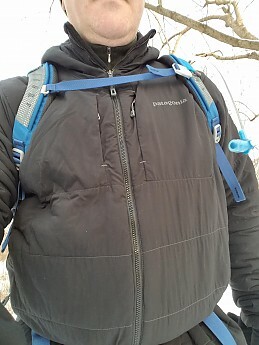 The Citro's multiple pockets should appeal to organized hikers. 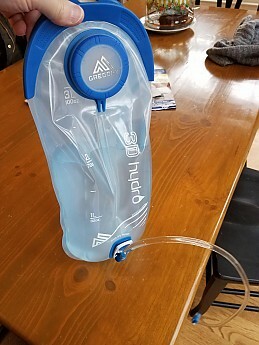 The included 3D Hydro 3 liter reservoir is excellent, and the hydration solution is unusually flexible...but mine had durability issues six months out, so I downgraded from 4 1/2 stars to 3 1/2. 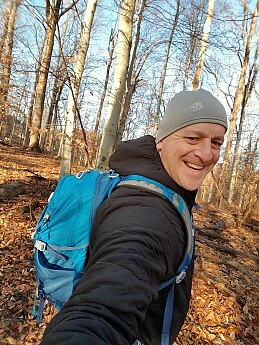 The pack remains a favorite in our house, a small pack that can swing above its weight, depending on your needs and gear. The Citro 25 falls into a popular niche of large day packs that can carry a decent amount of gear for a variety of conditions. 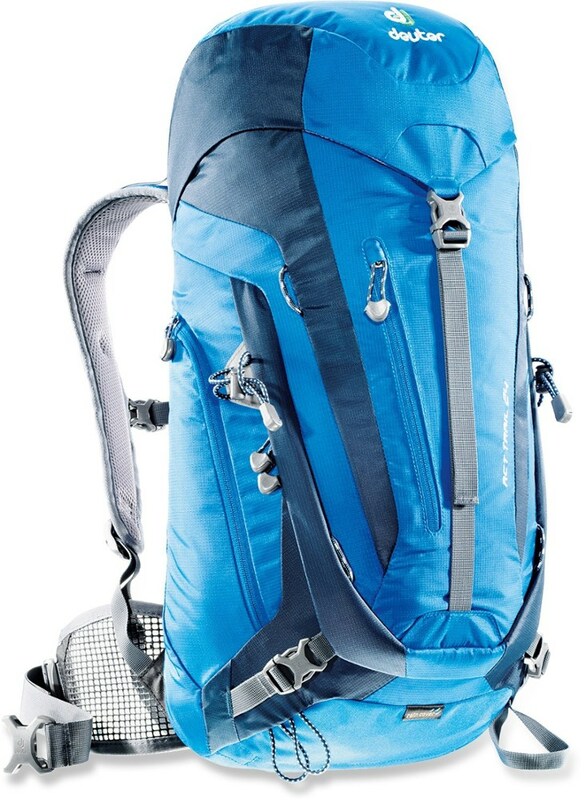 25 liters is about 1500 cubic inches—call it a "day pack plus." 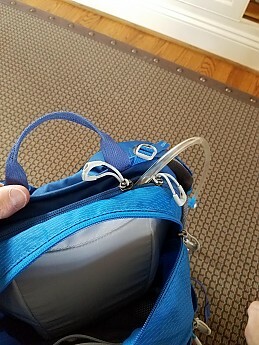 Also, keep in mind that the main compartment is adjacent to a separate hydration compartment and accessible via a U-shaped opening with a zipper. It feels a tad smaller in capacity than a 1500 cubic inch top-loader with no other internal pockets, though its numerous organizational options may be a plus for many people. It weighs 2.3 pounds on my electronic hand scale, including the 3 liter hydration reservoir (empty of water). The Citro distinguishes itself from some large day packs by offering a mesh panel that separates your back from the body of the pack—a design feature that can allow sweat to disperse better than having your back up against the backpack. In addition, the Citro supplements the hard plastic many packs this size use to create some frame-like rigidity with an actual frame, a spring-steel rectangle (Gregory calls this a "leaf spring" frame) with a cross beam in the middle (think if it as the same shape as a capital "B" or the number 8, except that it's not curved at all). 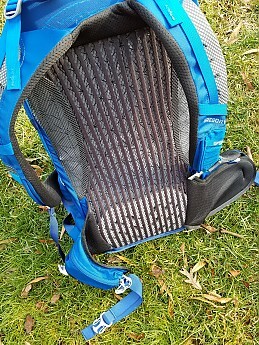 You can see that this pack has two compression straps on each side. The suspension marries the steel frame with a reasonably aggressive lumbar support (see the white perforated piece at the bottom of the back panel, above) and a hip belt that wraps around nicely. Having a good lumbar support is a feature that is consistent across most Gregory packs, part of the brand's DNA in my experience. The mesh back doesn't feel like a trampoline, fortunately, but it functions as you would expect, as your back won't feel quite as sweaty on a warm day. The hip belt is lightweight mesh that is soft but not padded with any foam and wraps around the sides of your hips but does not extend in front. 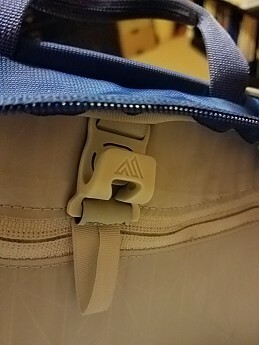 The hip belt straps pull inward to tighten. The sternum strap adjusts up and down on sliders on the shoulder straps and has a nice magnet on the sternum strap clip that helps it attach AND grab the hydration valve. I think it's the first pack I have seen where the sternum strap attaches to the pack with a magnet instead of a clip. It works fine, slightly fiddly to unhook. Not super easy to see, but the valve for the hydration is magnetic. Better photo of the valve below in the hydration section. Note the tube attached to the sternum strap clip. 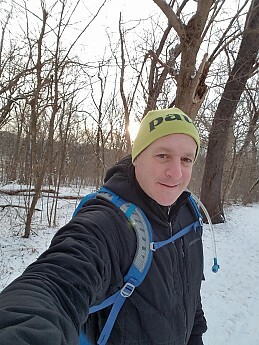 The hip belt has pockets on both sides that are made of solid nylon, not mesh, and that are large enough to hold a couple of energy bars or a smart phone. 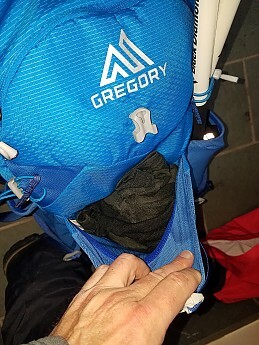 The side pockets are stretchy mesh and are a great place to stow hats, gloves, a smart phone or GPS, or a water bottle if you aren't using the included hydration reservoir. It's a bit of a "chicken wing" exercise to extract a bottle from these, whereas it is easier to stow smaller stuff in these pockets. 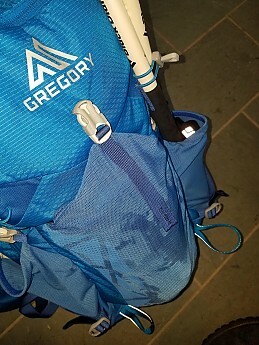 I also used a mesh pocket to grab my collapsible trekking poles, along with an elastic that could either secure poles or an ice axe; this pack has two ice axe loops and thin elastic tie-downs. 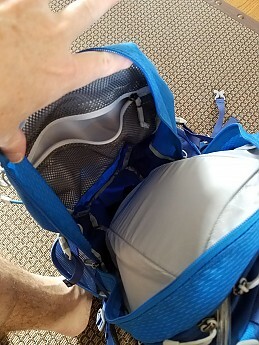 The main storage area is a decent size; because it's next door to the hydration sleeve, it can feel a bit narrow when the hydration reservoir is full. A smaller zippered pocket has a smooth fabric interior, less likely to scratch electronics. Note the flat mesh pocket inside the main pocket above. I tend to put my car keys and wallet in there. The pocket with the softer lining is below, a good place for your cell phone if you don't need to reach it. The back panel of the pack has a stretchy mesh pocket that clips shut and holds more than you would think it can. I stuffed a hard shell in at one point, a mid-weight fleece on another. The shell fit in; the fleece was a little more of a squeeze, but I was able to loosen the clip and fit it in. The photo below shows all the pockets zipped up. I'll talk about the hydration below. Note that all the zipper pulls are big, easy to grab and use with gloves on. They are also very lightweight. Despite that relatively significant loop, they did not snag on branches or brush during my testing. The zippers are particularly good on the hip belt pockets. They are about as easy to open and close as any hip pockets I have encountered. The shoulder straps are padded—lightly—and have cut-outs to reduce weight, and maybe let a little moisture out. The shoulder straps have small load lifter straps. You can see one in the photo above. While these often don't work on packs of this size, these do because they are anchored to the steel frame. The pack comes with a small extra magnet that also works with they hydration valve; more on that below. The hydration solution is a separate storage area that zips shut and has a clip that engages Gregory's new proprietary hydration reservoir. I talk about hydration in a separate section below. I read somewhere that a loop at the bottom of the left shoulder strap is actually intended to be a sunglasses holder. I guess, if you had your sunglasses in a case, you could clip it to that and let the sunglasses dangle, or you could fold the temples of the glasses over that loop. I don’t own a sunglass case that would safely do that, and I don’t think I would want to just fold the glasses over that small piece. A minor design detail most people could probably do without and likely won’t use. I’ll let you know if I see anyone hiking with dangling sunglasses. 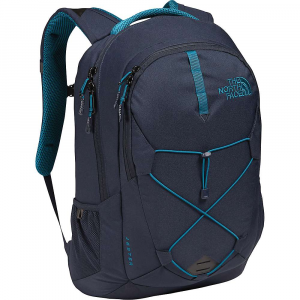 This is a one size fits all backpack; it worked fine for my approximately 19.5-20 inch torso and could go quite a bit shorter and a little longer. The hip belt works by wrapping your hips rather than providing any padding, but it is very comfortable, even at weights you might not otherwise carry in a backpack this size. For the most part, I carried 12-20 pounds in this backpack, but I loaded it to 25 pounds for one hike and 32 pounds for another. At 25 pounds, this backpack is fine. It doesn't pull or tug on my shoulders or hips in the wrong places, and the frame does its job. At 32 pounds, the hip belt felt like it was about at its limits, and I would have appreciated slightly more padding in the shoulder straps. Nonetheless, I walked a few hours with 32 pounds in this backpack, and I didn't feel at all sore. I wouldn't want to go much heavier than that, but most backpacks this size can't handle that kind of weight. The mesh back succeeds in abating some sweat. 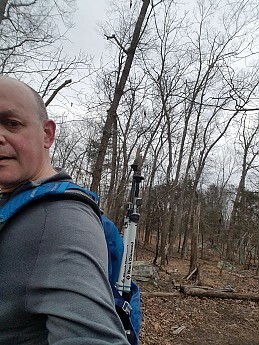 I noted this in particular during a number of hikes the last few weeks, when the temperatures climbed into the sixties and seventies in this area. 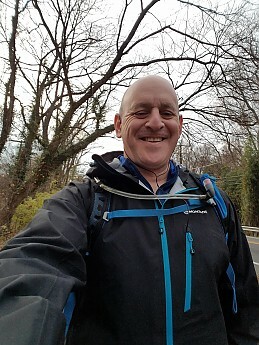 No backpack is going to keep your back completely dry if you're prone to sweating and going uphill at a decent pace, but this is definitely better in that regard than, say, the climbing-oriented packs I use that have a flat nylon back (Wild Things Guide Pack and Cold Cold World Ozone). Perhaps more importantly, the back panel is really comfortable. The lumbar support sits exactly where you want it, and there isn't much give. This isn't a loose trampoline, and the pack feels very stable, even fully loaded. The photos above tell the story. People who want varied storage options will like this backpack. 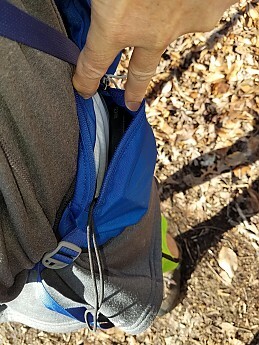 Good-sized outer stash pocket, main pocket with a small zippered mesh compartment, small electronics/cell phone pocket, two mesh side pockets (bottles or hats/gloves/snacks. As I explained above, I prefer to use those for things other than bottles, but they are large enough for a liter bottle, two hip belt pockets. The main pocket has a good, large U-shaped opening so things are easy to access. Note, the main pocket isn't super-large, and with the hydration reservoir full, it takes some stuffing to get things into the bottom. 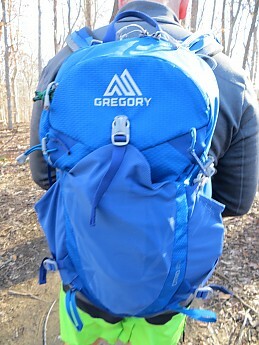 Gregory includes a three liter hydration system with this backpack, its new 3D Hydro 3L Reservoir, also available as a 2L reservoir. 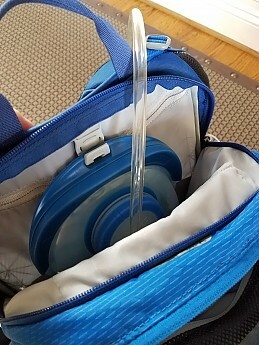 It fits in a separate zippered pocket, and it is designed to fit on a wide plastic hook inside the hydration pocket. There is a strip running the length of the pack that would lightly insulate the reservoir from the rest of the contents of the pack, a very thin layer of foam. No opportunity for the reservoir to move around much with that hard plastic hook. I wonder how durable the clip will be, but it seems more robust than a hook on a competing reservoir that repeatedly broke during use for me. There is also a nylon loop that could be used to secure other reservoir brands, if they have a hook or loop on the top, but this is really designed to work best with the proprietary reservoir. No apparent ports to let the tube out. Just use the top zippers to put the hose exit where you want it. The tube can emerge anywhere along the track of that zipper, so it's easy to have the tube come out on either side or the top. 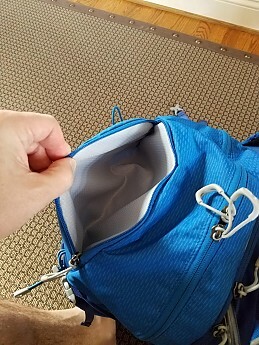 Of course, the main advantage of a separate pocket is that you can unzip and remove the whole reservoir to refill it without messing up the contents of your main pocket. Other companies already offered this, and it's a very helpful feature. As an aside, this also shows the haul loop between the shoulder straps on top. It's quite robust. I might hesitate to haul this due to the mesh back panel, but the loop is heavy duty. I expected the zipper to the hydration pocket might work a little loose while walking, but it really didn't. 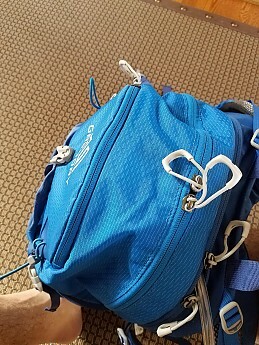 The hose can either run down the right shoulder strap, which has loops, then across to the magnet on the shoulder strap, or down the left shoulder strap, where there is a loop lower on the strap and a small magnet designed to fit onto the strap below the padded part of the shoulder strap. Puts the valve lower and along the shoulder strap, not across the sternum strap, again attached with a magnet. Tried both ways, pretty secure; both would work better if the hose were a few inches longer, I think. The 3D Hydro 3L Reservoir hydration system holds three liters; the opening is on the small side. There is a baffle in the middle of the reservoir to keep water from sloshing around. A significant plus of this reservoir is that the body of the reservoir isn't flat—even when empty. What does that mean? It's really, really easy to dry this reservoir out after using it. 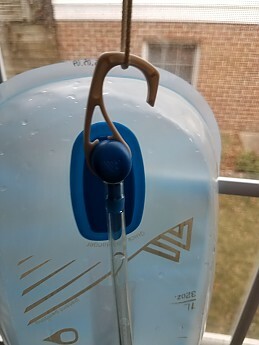 There is a hook that swivels out of the way when you're using the reservoir but that makes it very easy to hang it up—and because it's shaped and allows air to circulate, it dries out better than any other reservoir I have used. The bite valve is most similar to the solution Osprey proprietary reservoirs use, whereas Camelbak and Platypus valves are all soft poly, Gregory and Osprey have a valve that is soft where you bite down, on the edge, but solid plastic in the middle. Both the bite valve and the open/close valve are very easy to use. In general, I think the valve is well-designed (the little white piece in the photo below is the open/close valve). 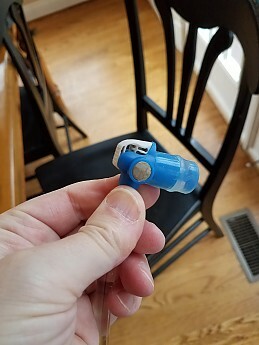 It also has a magnet that attaches either to the magnet on the sternum strap, or a small magnet that attaches to the nylon part of the shoulder strap. You can see the round magnet just above my thumb. The first time I used it, I found the valve opens and closes easily. I emptied the reservoir, hung it up to dry, and it completely dried out overnight. UPDATE 6/2017: Alas, despite the great design, the reservoir failed after six months of use. 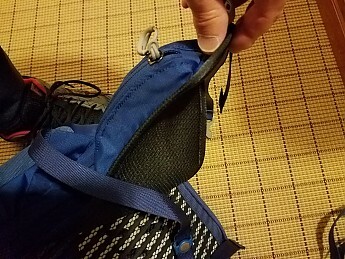 The plastic bag pulled away from the fill opening, discharging a lot of water into my backpack and rendering the reservoir unusable. This compares poorly with competing reservoirs, and I downgraded the pack from 4 1/2 to 3 1/2 stars as a result. The pack is great, and the reservoir would be great without the failure, but six months of use for a hydration solution is unacceptable. Hopefully, this was an unusual defect. The first day I used the backpack, I stuffed it full of clothes, filled the reservoir, and went five miles. It took me some time to get the shoulder straps and load lift straps situated. They are very easy to adjust while walking. I had it loaded to between 15 and 20 pounds. The suspension handled that easily, and the pack felt secure. 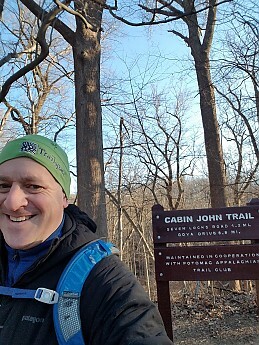 Because it was in the high 40s when I started but cooled off significantly, I was wearing breathable layers—a wool base layer and a mid-weight fleece. No back sweat at all. 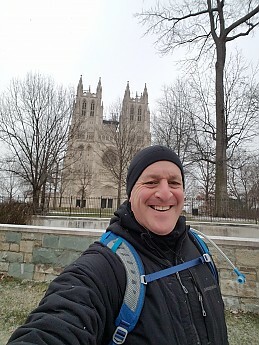 I took multiple other walks and hikes with this backpack over the last few months, adding up to somewhere between fifty and eighty miles on trails in the D.C. Metro area. generally carried no more than twenty pounds, except as noted above. 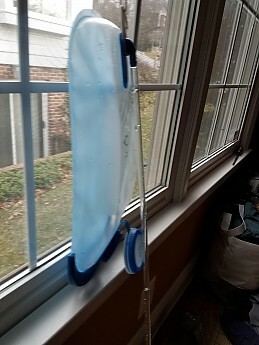 I tended to leave the hydration tube dangling. It occasionally hits my chin when I use it with the sternum strap. It's hard to comment on durability after such a short period of time. The best I can say is that stuffing this to the gills and carrying a lot of weight didn't damage the backpack at all. 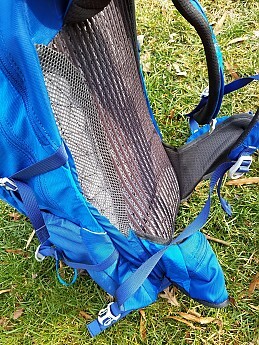 I stayed on trails, so I didn't test the durability of any of the outer mesh pockets—no opportunity to snag them in brush. The pack material looks and feels sturdy, particularly the bottom, which is a heavier grade nylon. I would take some care about the back panel. Worn on your back, it can't snag, but like most ventilated panels, it's not as durable as a piece of solid nylon. 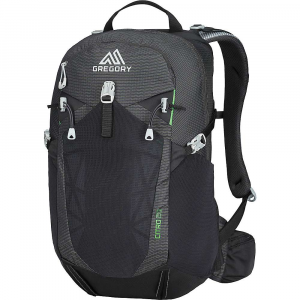 With its carry capability, relatively light weight, and tool tie-downs, it is a pack you could take on long day hikes year-round. Note the small white clip on the sternum strap below. It doesn't clip in—fully magnetic attachment to mate on the other shoulder strap. First time I have seen that. It worked, never pulled away while hiking. 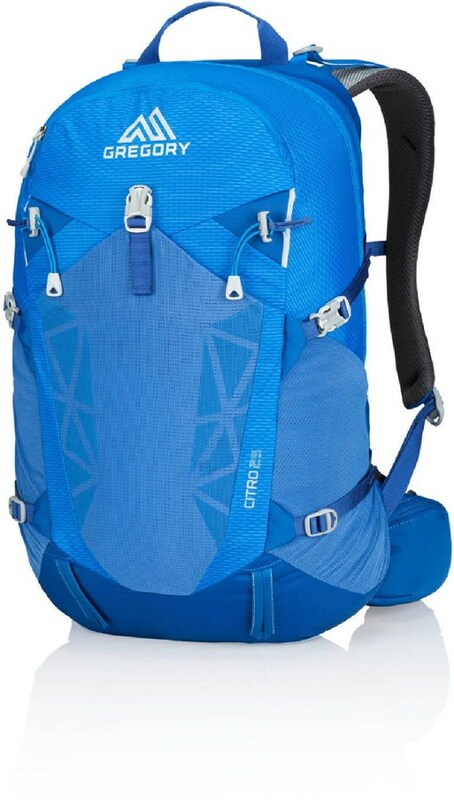 The Citro 25 is a worthy addition to the day pack plus category, better suited to carrying significant weight than most backpacks of this size (and plenty of larger backpacks, I might add). 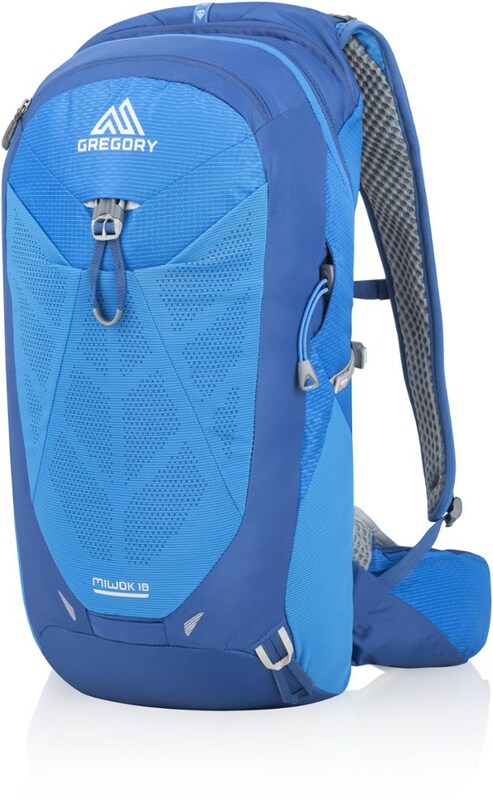 I like the fact that this pack does some interesting/innovative things with design that make the pack easy to use, yet it doesn't compromise on the basic functions of being comfortable and carrying stuff easily. P.S. If you like the design and have concerns that it has too little or too much space, Gregory makes this backpack in 20-liter and 30-liter sizes too. 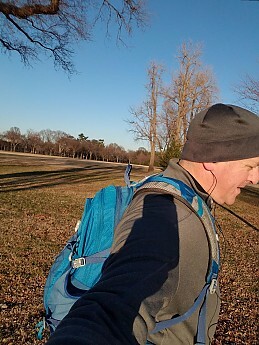 I like the Citro backpack a lot and will undoubtedly continue to use it often. That is true with or without the reservoir, which is a great design that could have durability issues. Nice review, Andrew. 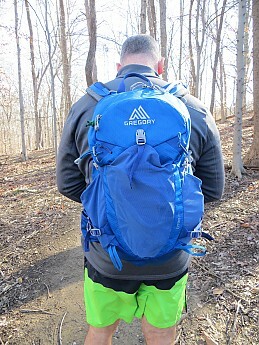 I think the 22-25 liter pack is ideal for most day pack needs--not too big and bulky, but not to small either. This looks like the best of both worlds. Forget the review, I want more pics of the lime shorts! ;) Nice review, Leadbelly! Nice review, Andrew! It looks like a solid pack. I personally like the magnetic reservoir tube option. A very good review. Made me decide to buy Citro 30. Thanks for the update, Andrew. Too bad about the reservoir failure.